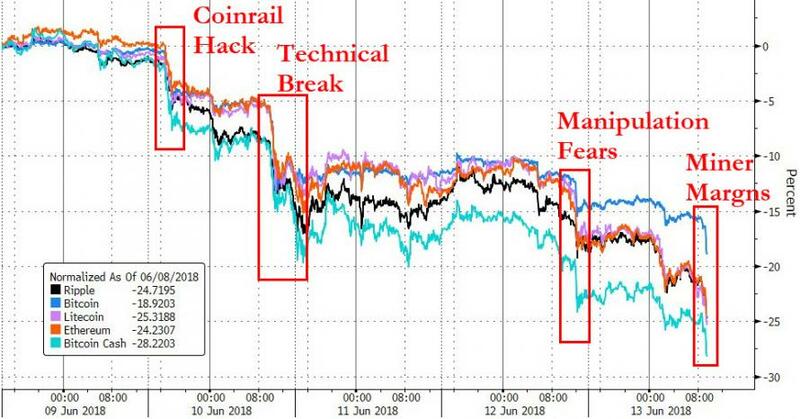 Another day, another leg lower in cryptocurrencies as FUD spreads, this time on the back of headlines exposing market manipulation during last year's meltup and collapsing margins for miners as prices tumble below breakevens. 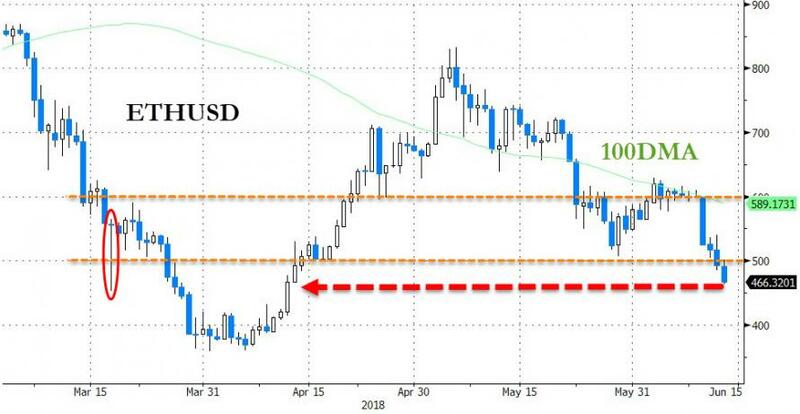 After the Coinrail hack prompted scaredy-cat South Koreans to dump their crypto, Bitcoin and Ethereum both broke critical technical support levels (BTC $7,000 and 2018 lows; ETH 50DMA & $600 figure). Things were 'calm' on Monday but then came headlines that, according to research by a University of Texas professor - known for flagging suspicious activity in the VIX benchmark - Tether, one of the most-traded cryptocurrencies, shows a pattern of being spent on Bitcoin at pivotal moments, helping to drive the world’s first digital asset to a record price in December. “Tether seems to be used both to stabilize and manipulate Bitcoin prices,” finance professor John Griffin and co-author Amin Shams wrote in a paper released Wednesday. Bloomberg reports that questions about Tether and Bitfinex have dogged the cryptocurrency world since last year, when Bitfinex lost banking relationships yet continued to operate. The U.S. Commodity Futures Trading Commission subpoenaed both firms in December, seeking proof that Tether is backed by a reserve of U.S. dollars, as it claims. Tether and Bitfinex haven’t been accused of wrongdoing. The analysis showed a pattern of Bitcoin price support, Griffin said. First, Tethers are created by the parent company Tether Ltd., often in large chunks such as 200 million. Almost all new coins then move to Bitfinex, he said. 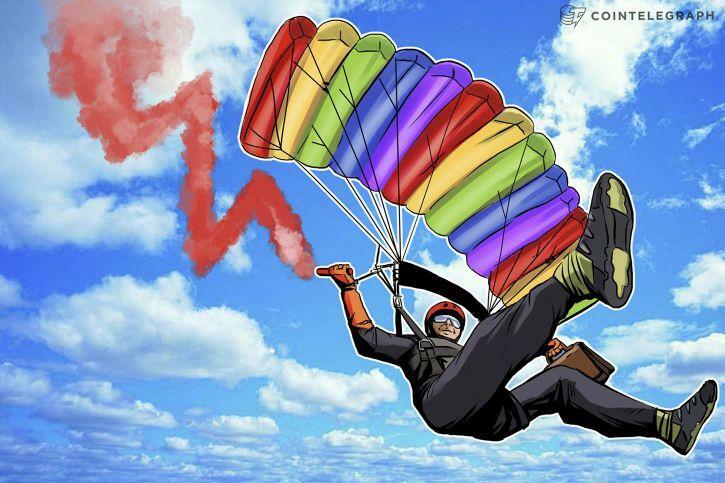 When Bitcoin prices drop soon after the issuance, Tethers at Bitfinex and other exchanges are used to buy Bitcoin “in a coordinated way that drives the price,” Griffin said in an interview. Griffin’s paper describes several patterns uncovered in a yearlong period. First it found that flows weren’t symmetric. When Bitcoin’s price fell, purchases with Tether tended to increase, helping to reverse the decline. But during times when Bitcoin rose, Griffin said he didn’t see the reverse occur. That’s “suggestive of Tether being used to protect Bitcoin prices during downturns,” he wrote. 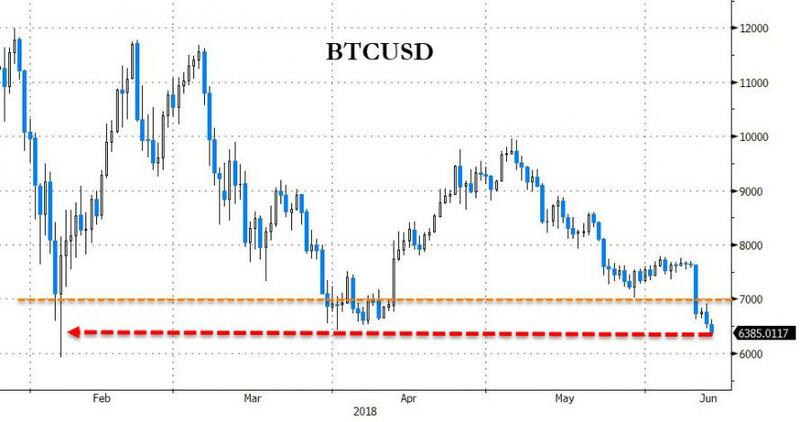 And investors have clearly found this unnerving and have unwound their crypto longs; but it gets worse, since away from the pure speculative activity in Crypto, the tumbling price of Bitcoin has forced miners into a corner, as CoinTelegraph reports that the leading cryptocurrency has now fallen below what some commentators consider to be an average BTC mining profitability threshold of $6,500. Robert Kelly told CNBC earlier today that this figure assumes that Bitcoin miners need to update their hardware almost every 18 months, bringing the costs of mining to roughly between $5,900 and $6,000. Mining profit margin calculations globally have indicated a wide threshold, ranging between an extremely cheap $531 in Venezuela to a whopping $26,170 in South Korea. Aside from hardware costs, the local cost of electricity supplies is the other key factor affecting miners’ profits. Bloomberg's Gadfly headlined so eloquently "Bitcoin miners fried in game of chicken," pointing out that the 70 percent price drop since the heady days of mid-December has cut profitability to the bone. With the cryptocurrency nearing $6,000, only the biggest and most efficient can stay above water, but even these are balancing on a knife edge, according to a Gadfly analysis. Gadfly's calculation suggest that had Bitcoin stayed at its 50-day moving average of $13,200, then the average miner could expect to print $80 per week in profit at current levels of computation (hash rate) and difficulty. This is based on the very generous assumption that a miner is running Bitmain Technologies Ltd.'s Antminer S9 at 13.5 TH/s (retail price $2,320), one of the most advanced systems available, and the set-up is in China at wholesale prices. Older equipment will have lower returns, and a lot of those mines are still online. If the price doesn't rise, then the average miner is set to lose $3 per week at current levels. Mining syndicates such as Antpool -- which are probably buying their mines at less than the retail price -- may still be making money, but will be getting returns 90 percent lower than they would at that 50-day moving average.